From corporate cafeteria menu boards to hallway employee signage. From lobby displays that tend architectural to meeting room displays for the ultimate in resolution and interactivity. Corporations around the world utilize Planar technology for the ultimate in productivity. But the environments of this productivity are changing. Over the past few years, we have seen dramatic changes in the commercial real estate market that are combining to change the look of offices and the opportunities for technology. Small businesses, which make up the bulk of corporate enterprises, have real estate leases less than 10 years. As a result, landlords are less likely to finance expensive and permanent tenant improvements. This combined with the credit crunch has affected property financing overall. This has resulted in more open concept workspaces and has increased workplace density. Technology has enabled new ways of work, like telecommuting, that are enabled in open workspace environments. Combine this with ADA-accessibility regulations and a desire for more environmentally sustainable business practices and the result is mobile computing, use of video conferencing systems, and the transformation of the meeting room from a place of passive engagement to one of interactivity, collaboration, and rapid decision making. 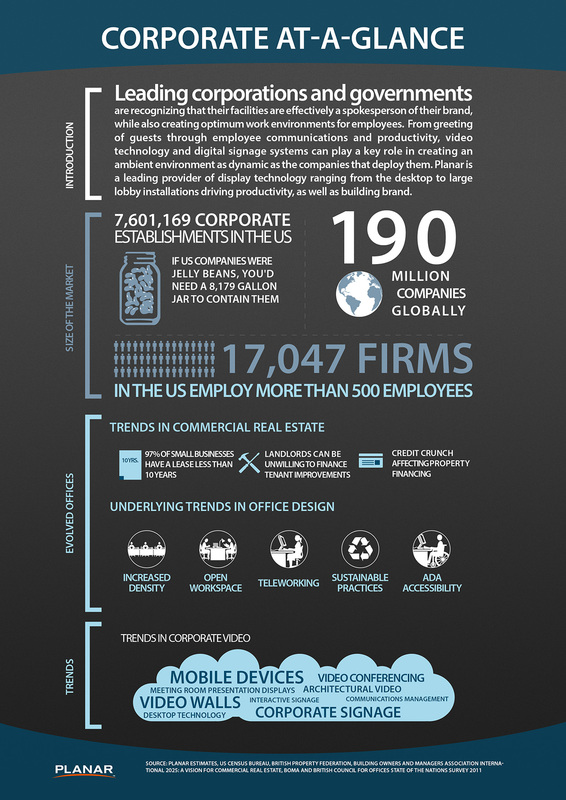 For more information on these trends, download the Corporate At-A-Glance infographic or visit http://www.planar.com/solutions/corporate/ for more details about Planar’s solution for corporate environments.